Well this is the week of phoenix- and man is there a lot of things going on this week. Updates will continue but i might still be scarce. Once phoenix is done we will be back in the swing of things and hopefully I’ll be around a bit more. My big phoenix update will be on wed, so if you are in the phoenix and are going to the con be sure to check in. And what about the face in the rock (panel one)…??? What is that in the second panel? It looks like a stone outcrop but it has an arm/branch with tiny pipes sticking out? And what's that above the crater? It looks like one of those matrix pods.. 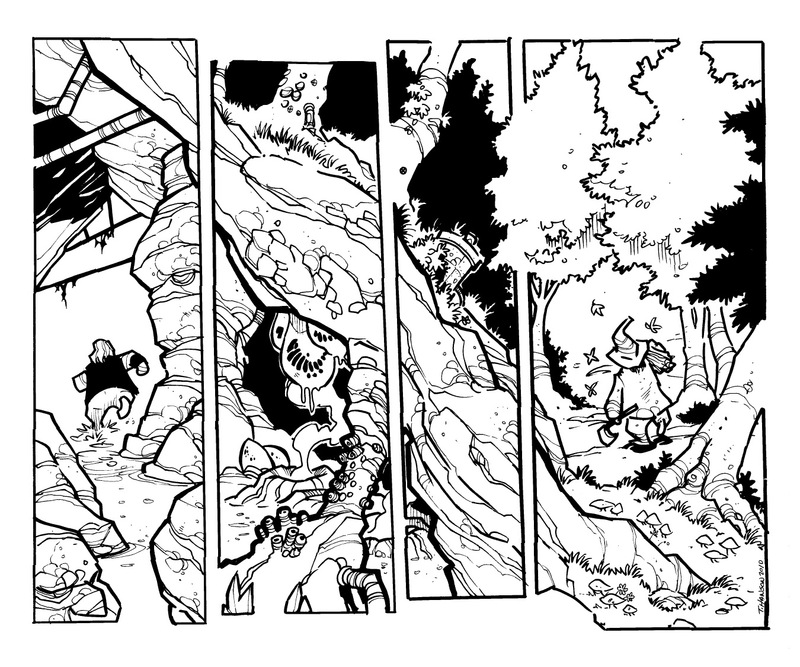 I know the whole page is a transition to the wood gatherer, but that panel mystifies me. yet those sacks are underground and if you remember way back in bean's journey there were other sacks just like them- could they be something else? something darker and sinister? well played! I'm guessing more to come on those sacs then.. Thanks for taking the time to go back and answer everyone btw! GREAT COMICS!!! I just finished reading all of them. They are amazing. I recentl bought two of your buttons. One of them had a smoking troll (which i lost). and the second had a pirate teddy bear. It was the coolest buttons i've ever bought. i wear them on my beanies everyday. keep up the good work! I wonder were he is going and what he has in mind.